Hotdogs and hamburgers—they’re the grilling staples of the summer, but not the only ones. Grilled fish, especially salmon, is good for you and very tasty. As you fire up the grill this summer be sure to try this recipe for lime and Sriracha salmon tacos. It’s topped with a delicious mango salsa and chipotle aioli. These fish tacos are made with salmon, a healthy fish with omega-3 fatty acids that reduce inflammation and lower your cholesterol. 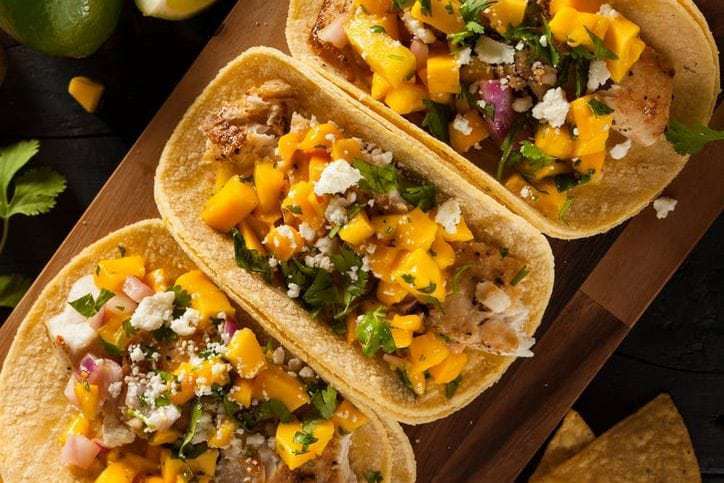 The fish tacos are then topped with a mango salsa. The mangos in this salsa are rich in vitamin C, vitamin B6, fiber, and vitamin A. With these nutrients, mangos can help prevent cancer and improve your immune system. This fish taco recipe has a lot of ingredients and a lot of steps, but the final product is definitely worth it! You can save time by making the chipotle aioli and the lime and sriracha glaze a day in advance. Check out the recipes below for this refreshing summer meal. Add soaked, drained cashews to a high-speed blender with the water, lemon juice, sea salt, maple syrup, chipotle pepper, and adobo sauce. Blend on high until creamy and smooth, adding more water as needed to encourage blending. Scrape down sides as needed. Adding a little oil is optional and adds extra creaminess. Smoked paprika is also optional and adds a sweet smokiness to the sauce. Taste and adjust seasonings as needed, adding more salt to taste, lemon for acidity, maple syrup for sweetness, or adobo sauce for heat. Put the sauce in a bowl, set aside for later, and make the salsa. In a serving bowl, combine the prepared mango, bell pepper, onion, cilantro, and jalapeño. Drizzle with the juice of one lime and mix well. Season to taste with salt. Put the salsa aside and let rest while you prepare the salmon. To make the glaze for the salmon, whisk together the honey, soy sauce, rice vinegar, Sriracha, lime zest, and lime juice until thoroughly combined. Transfer to a small pot on the stove. Heat the mixture over medium-low heat, bringing it to a light simmer, stirring often to avoid burning. In a small bowl, whisk together the cold water and cornstarch. Mix it well until cornstarch has completely dissolved. Slowly pour the cornstarch mixture into the lightly simmering glaze while stirring. Continue to stir until the sauce thickens into a glaze. Turn off heat and set the pot aside. Season the salmon with a few sprinkles of kosher salt and black pepper. Spoon the glaze over the salmon and, with a basting brush, spread the glaze evenly over the salmon. Place sliced limes over the fillet, cover, and cook on the grill for 12-15 minutes. Once the salmon is ready, carefully remove the fish from the grill and discard the lime slices. Top with sesame seeds and thinly sliced scallions. Cut the salmon into pieces and load the fish into the flour tortillas. Add mango salsa on top of each taco as well as a drizzling of the chipotle aioli. Bonus. Including more salmon in your diet is important for your health. Salmon tacos are a great way to have salmon for lunch or dinner, but if you’re interested in having salmon for breakfast you should consider this recipe for salmon patties.